Lightning PDF Professional is the complete PDF alternative to Adobe Acrobat. 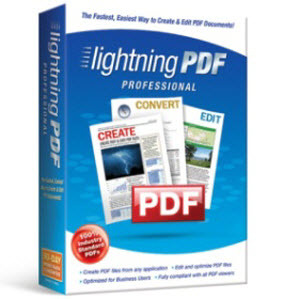 Lightning PDF Professional will help you easily create, convert and edit PDFs - plus much more. Create industry-standard PDF files in a single click. Create PDF Files Use One-Click creation tools integrated with Microsoft Office, create optimized PDF files from any Windows application and easily produce 100% industry-standard PDF files that can be opened through any PDF viewer. Assemble & Combine PDFs Create a single PDF file from Word documents, PowerPoint presentations, Excel Spreadsheets, other PDF files, graphics, images, and more. For even easier viewing, combine multiple documents and document types into a single PDF file. Touch-up Text Add, edit, and delete text directly on PDFs. With Lightning PDF Professional, you don’t need source files to fix typos, remove text, and reformat paragraphs. Insert & Enhance Images Add images and insert graphics directly into your PDF file or use built-in image tools to resize, move, optimize and delete existing graphics. Draw and Markup No more marking up paper documents! Use the pen, circle, box and other markup tools to quickly and easily comment directly on PDFs. Sticky Notes that Stay Easily add digital sticky notes to PDFs, so your recipients always get your comments! Bookmarks & Hyperlinks Create interactive PDF files with Lightning PDF. Jump to any page of your PDF with bookmarks, or open external web pages with PDF hyperlinks. Watermarks & Stamps Apply your own watermarks and stamps to your documents. Ensure that recipients know whether information contained in your PDF is confidential, a draft, or for review. Secure PDFs Don’t let sensitive information fall into the wrong hands! Use passwords and digital certificates to ensure document integrity and even restrict PDF features such as copying, printing and editing.